A convention center that hosts international academic events that contribute to the globalization of the campus. 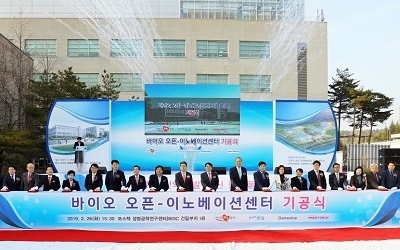 POSCO International Center opened in August 2007 to effectively contribute to the globalization of the campus, such as hosting international conferences. In addition to a 300-seat international conference hall with 5 language simultaneous interpretation facilities, this convention center is fully equipped with various sized meeting rooms, lodging and dining facilities. POSCO International Center, a building with 5 stories aboveground and 2 underground levels, has a convention center (International Conference Hall, large-size meeting rooms, medium-size meeting rooms, small-size meeting rooms), 60 guest rooms, a Western restaurant (buffet restaurant), a Chinese restaurant and 200-seat indoor and 300-seat outdoor terraces. Main conference rooms can be extended to a 60-seat room by combining two 30-seat rooms and a small-size meeting room can be modified to have 25 seats including chairs (11) in the meeting room and additional chairs (14) for attendees.